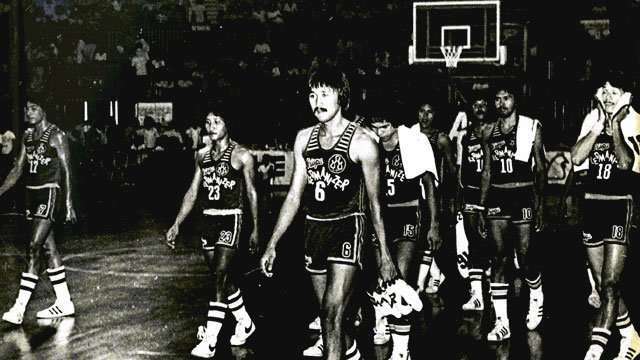 THE WEIRD 16 BRACKET: What’s the weirdest PBA team name of all time? 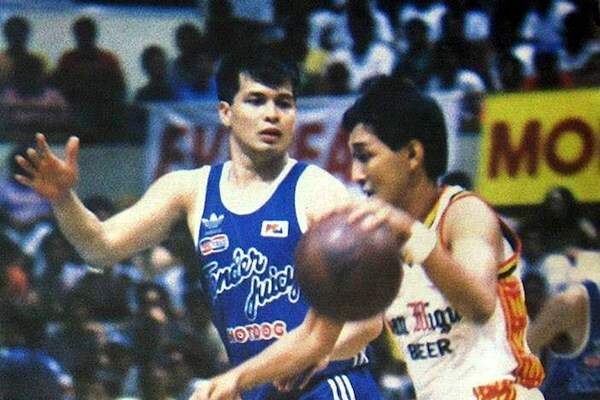 Not all PBA team names are created equal. On one hand, you have Barangay Ginebra—catchy, quintessentially Pinoy, and with that built-in sense of unity. 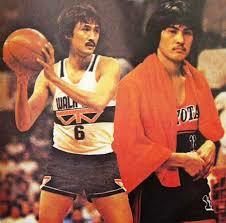 A player is a ka-Barangay, the fans are ka-Barangay, easy. But on the other end of the spectrum, you get…Columbian Dyip. 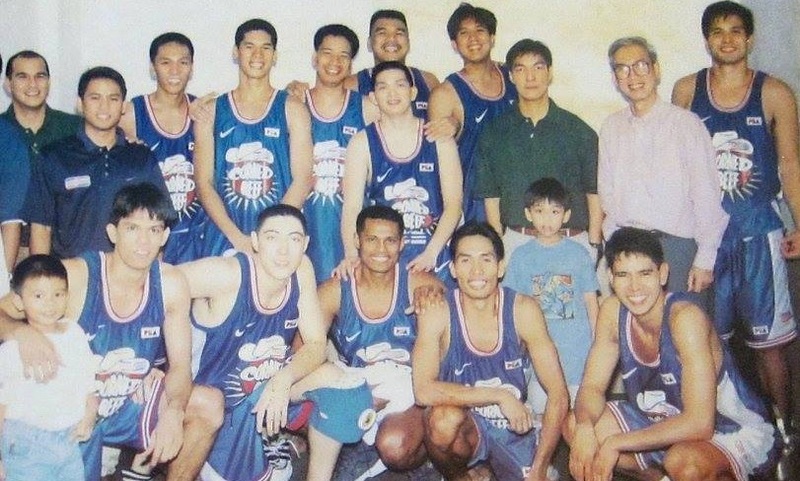 So which PBA team name is the weirdest of the weird? – Vintage Bracket – covers weird team names created from the PBA’s conception in 1975 to 1989. 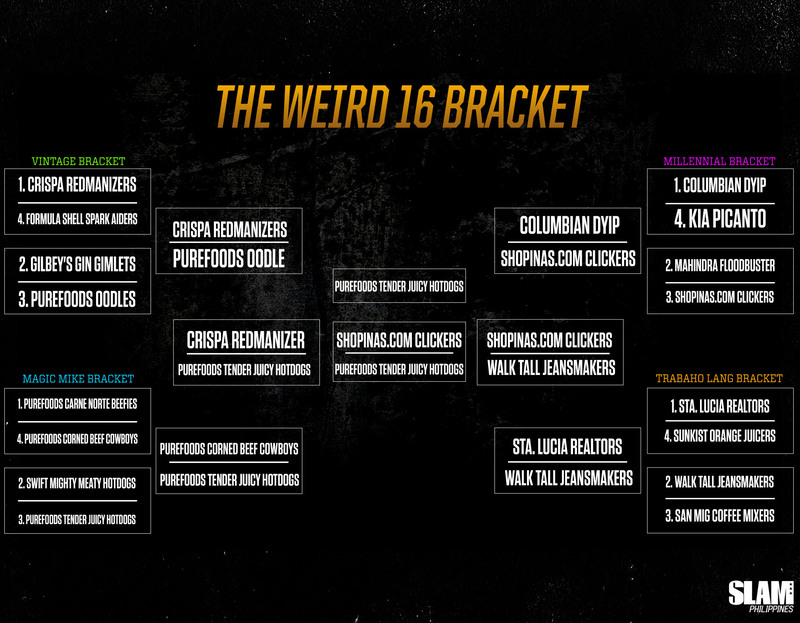 The Crispa Redmanizers, a team name that is as legendary as it is head-scratching, is a Vintage Bracket Team. – Millennial Bracket – covers weird team names created from 1990 to today. Columbian Dyip, the newest PBA team and instantly one of the weirdest, is a Millennial Bracket Team. – Trabaho Lang Bracket – covers weird team names that double as the last job you’d ever associate with a competitive professional basketball team. The Walk Tall Jeansmakers are a first-ballot Trabaho Lang Bracket Team. – Magic Mike Bracket – covers weird team names that have a strange, almost ungodly fascination with meat. Fortunately for basketball fans everywhere, there are so many teams to choose from—most notably, the Purefoods Tender Juicy Hotdogs. CEEJ: It’s a testament to how good the Crispa team was that they got away with calling their themselves “Redmanizers.” Even my dad, who followed them at their peak, doesn’t know what a Redmanizer is. It turns out the textile company Crispa would print packaging saying their products were “redmanized.” This referred to a process that…no, did not make anything red, but made their fabrics softer and less prone to shrink. If the goal was to educate the public about obscure garment processing techniques, sorry Crispa, it’s been forty years and all my dad can say is: Basta, yun pangalan nila. TOBY: If Crispa’s claim to fame was that their Redmanized clothes were immune to shrinking, can someone please explain why Bernie Fabiosa’s shorts were three sizes too small? CEEJ: Formula Shell Spark Aiders is guilty of the same crime, which is trying to force the name of their technology into their team name. Which is a shame, because take out one word and you have the perfectly acceptable Formula Shell Spark. CEEJ: Barangay Ginebra is a team name that knows its target market. Gilbey’s Gin Gimlets? Not so much. Gimlets were popular in the British imperial navy because the lime juice fought off scurvy, but here in the Philippines, gin distributors have more success selling the alcohol as something to be drunk straight. Also, “Gimlet” sounds more like a name of a person in the “Jimwell” or “Honeylet” tradition. TOBY: Or the dude that says “AND MY AXE!” in Lord of the Rings. CEEJ: HEY. I love Gimli (son of Gloin) and he deserves better than to be associated with a weird PBA team name. Now, the Oodles get double awkward points for being named after instant noodles and sounding like a children’s party mascot. TOBY: The Millennial Bracket was thiiiis close to becoming the Kia Name of Shame Bracket. Since the franchise’s arrival in 2014, Kia has changed its team name a grand total of 6 times. I don’t even know how that’s possible. You’d think at least one of those would be a keeper. Nope. TOBY: Not complaining! Badly-named franchises are a beloved basketball tradition, like unfriending Ginebra fans during the Playoffs. Kia Picanto sounded weird then and it sounds weird now. Basketball is a game that’s (ideally) played with very large humans. Instead, they decided to name the team after a car that’s small, affordable, and underpowered–kinda like the actual team? That’s both weird and sad. Meanwhile, Columbian Dyip is the first team name of the franchise that’s not named after an actual car. Meaning they could’ve gone with any car-related team name under the sun. Any! Why they chose to go with Dyip is beyond me; it’s no fun to say; it’s no fun to read; I bet it’s no fun to wear the words ‘DYIP” on your chest. The only fun thing about the name is how fun it is to make fun of. TOBY: With all due respect to the unassailable legacy of the Santa Lucia Realtors, that’s just an awful name for a basketball team. Couldn’t they have been the Santa Lucia Sledgehammers? The Santa Lucia Wrecking Balls? The Santa Lucia Bulldozers? Hell, the Santa Lucia Carpenters would have been better. Have you ever played basketball with a karpintero? They will school the ever-living crap out of you with their bare feet and Pan de Manila abs. The Sunkist Orange Juicers sound like a bunch of dudes who have turned orange because of PEDs. CEEJ: To me they sound like harvesters at an orange grove. Which means they would also have Pan de Manila abs. TOBY: Either way, at least they sound like they’re good at basketball. TOBY: From a vehicular standpoint, the Mahindra Floodbuster is definitely the most appropriate choice in franchise history–it’s big, it’s strong, it’s rugged. From a team name standpoint however, it falls apart. How exactly do you bust a flood? You can’t. Floods bust you, son. They get a pass though as the Shopinas.com Clickers are coming to win this bracket. CEEJ: Not just Shopinas—Shopinas. DOT. COM! TOBY: Is there anything less millennial than adding .com to the end of a website? 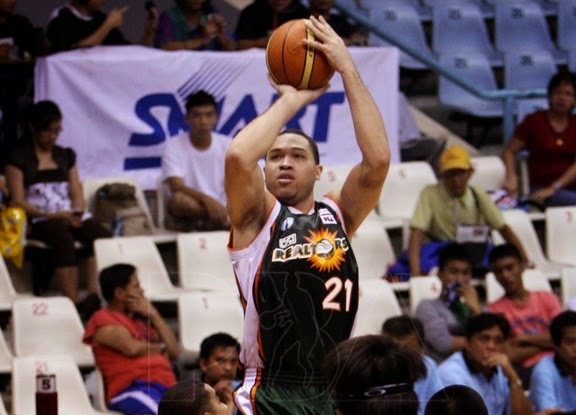 Are you reading this article on slamphilippines.com? If you’re enjoying it, please be sure to like it and share it on facebook.com, twitter.com, or double U, double U, double U, dot, friendster, dot com. CEEJ: I feel bad for the anchors, reporters and arena barkers who had to say that over and over…with gravitas. TOBY: Both of these team names are bad, and whoever thought of them should feel bad. Jeansmakers give me mental images of chatty titas toiling in some Manila sweatshop. Coffee mixers make me think of sad, overqualified interns going through a quarter-life crisis. Either way, why would you want to make them the face of your basketball team? The Walk Tall Jeansmakers get the slight edge because I wanna imagine Atoy Co playing in tight, denim, NSFW short shorts. CEEJ: Another way to think of this is who you’d bet on in a street fight? Coffee Mixers would throw hot coffee in your face. Painful, sure, but Jeansmakers can brain you with a sewing machine. 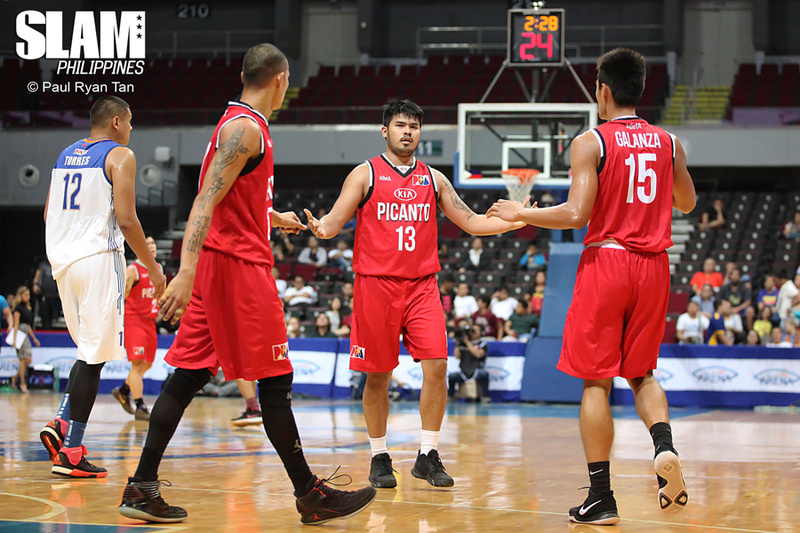 CEEJ: Okay, we gave KIA a tough time for having three out of four slots in the Millennial Bracket, but the Purefoods Franchise actually has a total of four bets in two different categories—three of which are in the macho dancer category. Hats off to them for being consistently weird and unintentionally sexual over an extended period of time. The key to a good macho dancer name is storytelling, like how you immediately know Thunder From Down Under will bring you abs and Aussie accents. Carne Norte Beefies vaguely sounds like Ilocano hacienderos, but there’s nothing more Classic Macho Dancer than a Cowboy. TOBY: …cool. Guess I’m never eating corned beef ever again. TOBY: It’s funny until your mom asks if your hotdog is mighty and meaty or tender and juicy. CEEJ: All hotdogs are meaty. Not all hotdogs are juicy. TOBY: This is like if the Raptors met the Cavs in the second round. It’s a damn shame team names this good are meeting this early. 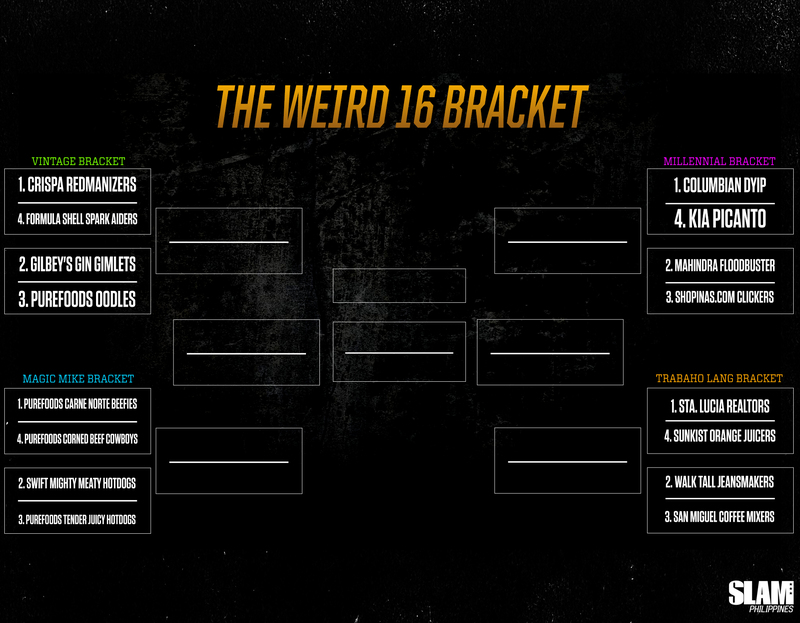 But that just goes to show how stacked the Weird 16 is. CEEJ: There is no shame in being eliminated from this matchup. We both know they’re finals-worthy teams. TOBY: The biggest thing Columbian Dyip has going for it is the spelling. Until you realize that the spelling is a crutch. That’s really all that makes it weird—‘Columbian Jeep’ is perfectly normal. Inversely, if every weird team name in the PBA went with a weirder spelling I don’t think our collective brains would be able to take it. TOBY: Let’s try that street fight argument one more time. It’s the dying minutes of the Manila Clasico. Tie game. A fight breaks out right in front of you–one of them is a realtor and the other is a jeansmaker. Who ya got, Ceej? CEEJ: Realtors because they can make a spreadsheet of plus-minus. TOBY: Get those anuhlytics outta here, Erneh! Can a realtor work in a shop best described as a human rights violation? Are they handy with a pair of scissors? Can they turn a pair of ill-fitting dad jeans into the snazziest, most booty-hugging skinny jeans you’ve ever worn? None of this has anything to do with fistfights, or basketball for that matter, but you don’t mess with jeansmakers. TOBY: You see, it’s not enough to be called hotdogs. You have to look like a pack of hotdogs too. CEEJ: Corned Beef Cowboys take a slight edge in the weird jersey category, but to be called a Cowboy is still more dignified than to be called a Tender Juicy Hotdog. CEEJ: Oodles is weird, but you’re at least one letter away from understanding the product they were named after. 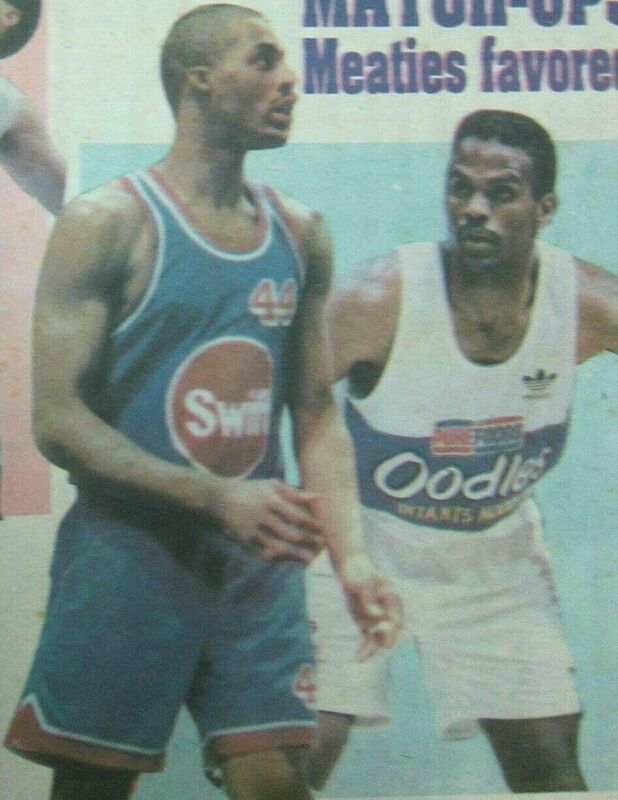 Even their jerseys had “Instant Noodles” in big letters under their team name. Redmanizers, on the other hand, offered no explanation. That takes balls. TOBY: So that’s Jeansmakers and Redmanizers in the semis. I kinda wish the Crispa franchise lasted a few more years just to see what other made-up words they’d come up with. TOBY: It goes without saying that both these teams names are bad. But they didn’t come out at the same time. The Walk Tall Jeansmakers burst into the league in 1979. Who knows what people in the disco era were thinking. For all we know, the Walk Tall Jeansmakers were actually a dope thing to call a basketball team. It just didn’t age well. The Shopinas.com Clickers were an atrocious name in 2012. And they’re even worse now. CEEJ: Both bad, but in different directions. Nobody knows what a Redmanizer is; meanwhile, Tender Juicy Hotdogs conjure up a highly specific and slightly disturbing mental image. It’s a tough one, isn’t it? Perhaps you can try and put yourself in the shoes of the players. Who would have been teased more by their fellow players? Who was an easier target for trash talking from other teams’ fans? In this case, embarrassment trumps confusion. 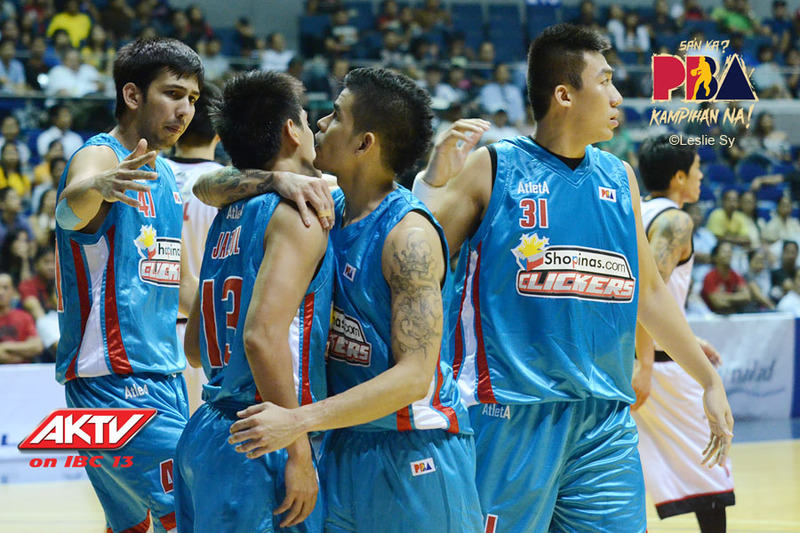 CEEJ: The Purefoods Tender Juicy Hotdogs were an iconic team that deserved better. TOBY: Exactly. Teams like the Shopinas.com Clickers elicit such strong reactions from our end because we never really got used to them–a page in the history books of a storied franchise. The Purefoods Tender Juicy Hotdogs have been a part of Philippine pop culture for so, so long that we’ve just accepted the team name’s inherent kookiness. Kinda like your tito who gets away with saying the most inappropriate tito-isms ever. But take a moment to really think about how weird it is to lionize a bunch of dudes name the Tender Juicy Hotdogs. CEEJ: In the words of the timeless Masculados—Jumbo hotdog, kaya mo ba ‘to? Hindi kami bato para magpatalo. I rest my case.